SelfMadeHero are bringing more ghost stories from M.R. James to life in the second volume of Ghost Stories Of An Antiquary. 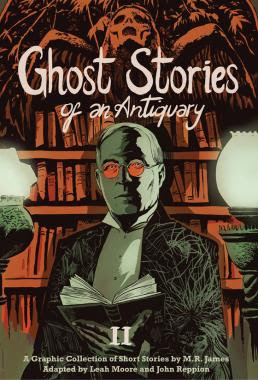 The second volume brings to life four stories re-imagined by writers John Reppion and Leah Moore, both who worked on Ghost Stories Of An Antiquary Volume 1 (review here). Ghost Stories of an Antiquary, Volume 2 collects graphic retellings of four uncanny tales by the renowned medievalist and writer. the four stories are: Number 13, Count Magnus, The Treasure Of Abbot Thomas, and Oh, Whistle And I will Come To You, My Lad. At once true to their source and powerfully reimagined for a visual medium, Leah Moore and John Reppion’s subtly crafted adaptations give a new lease of life to these classic stories of watchful guardians, architectural puzzles and ill-advised academic exploration.